Potash Corp. and Mosaic Just Hit 52-Week Lows. Time to Buy? 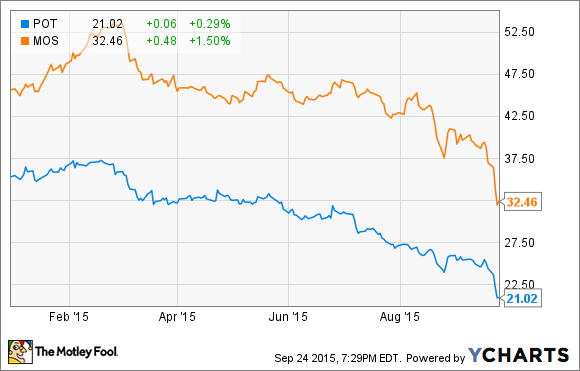 One stock looks great for value investors; the other may tempt dividend seekers. Potash and Mosaic investors have been taken for a bumpy ride this year. POT data by YCharts. The sounds you just heard were the share prices of The Mosaic Company (NYSE:MOS) and Potash of Saskatchewan (NYSE:POT), both collapsing to serial 52-week lows. In a singular chain of events, each of these fertilizer production companies hit a new 52-week low every day this week through Wednesday. Both Mosaic and Potash bounced higher Thursday, however. And this gets an investor wondering: Did we just hit bottom? Or is this what folks call a "dead cat bounce?" Source: Author. Disclaimer: No actual cats were injured in the making of this Google Drawing. To find out the answer, we're going to have to crunch a few numbers. Let's start with Mosaic, a stock that's lost 30% of its value since the year began, and currently sits within mere pennies of its 52-week low. Priced at less than 10 times earnings today, and less than 10 times free cash flow, as well, Mosaic doesn't look like it can get much cheaper than this. To the contrary, there's every reason to think that investors have overreacted by selling off Mosaic in response to lowered guidance for potash demand -- and the stock is starting to look like quite a bargain. Mosaic CEO Joc O'Rourke continues to see a "long-term positive outlook" for the company's fertilizer products. And unless you see prospects for the global population shrinking, or people developing an aversion to... food going forward, he's probably right about that. Wall Street is similarly bullish on the company's long-term prospects, whatever bumps in the furrow the near future may hold. According to data from S&P Capital IQ, analysts who follow Mosaic think the stock is likely to show 15% annualized earnings growth during the next five years. Strong free cash flow backs up very respectable GAAP earnings, lending further credence to the idea that Mosaic's earnings will rebound. Add in a generous dividend yield of 2.9%, with which Mosaic will pay you to wait for the rebound to come, and the stock looks mighty attractive right now. Mosaic's decision to cut potash production in response to weak demand seems to bode ill for the company that named itself after the product: Potash of Saskatchewan. It's no surprise, therefore, that Potash has suffered an even steeper decline in stock price than its rival -- down 40% since the year began. What may surprise you, though, is that while Mosaic and Potash are often viewed as two sides of the same fertilizer-smudged coin, the valuation picture is actually quite different at Potash than at its rival. Let's start with the price: At $21 and change, shares of Potash cost 11.6 times trailing earnings today. That's already a 21% premium over the valuation at Mosaic. Potash generates significantly less free cash flow than it reports as net income ($1.4 billion versus $1.5 billion net profit). Analysts foresee a slower growth rate for Potash (6% versus Mosaic's 15% growth rate). Potash also carries a heavier debt load than its rival (roughly $3.7 billion net of cash, versus Mosaic's $1.6 billion "net debt" load). Mitigating these negatives is the fact that Potash pays a dividend yield more than twice as generous as Mosaic's -- a whopping 7.2%, according to S&P Capital IQ data. On the other hand, this factor in Potash's favor could easily become a negative if management decides that 7.2% is too much to be giving away as dividends, and chooses to cut its dividend to redeploy cash toward, for example, reducing its debt load. Such a move could scare shareholders away in a hurry. The 30% stock slide at Mosaic, and the 40% plummet at Potash, have wrung a lot of risk out of both stocks already. Today, Mosaic stock looks like the cheaper stock, and the better play on a rebound in equities. Potash, on the other hand, looks like a better income play with its superb dividend yield. Personally, as a value investor, I'm more inclined to pick Mosaic over Potash. But I have to admit -- I see a lot to like in both stocks.